POS, NPD and convenient pack formats are key when it comes to driving biscuit sales, according to Burton’s Biscuit Company. 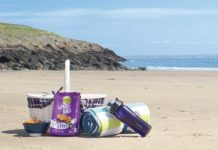 “As people’s lifestyles have changed, so too have their snacking habits, with food-to-go becoming an increasingly important category for forecourt retailers,” says David Costello, Head of Category and Shopper Management at Burton’s. While the total value of the Crisps & Snacks market stands at £2.8bn*2 (including Crisps, Snacks, Nuts and Popcorn), growing at 1.2% YoY, Savoury Snacks is the best performing area with Bagged Savoury Biscuits creating new opportunities for forecourt retailers. 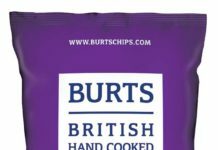 Burton’s entered the savoury sector early in 2014 with huge success, generating sales in excess of £25m*3 with Burton’s Fish ‘n’ Chips and Cathedral City Baked Bites, which together have driven almost 40% of total savoury biscuit growth*4, and are now competing alongside the big brands within Crisps & Snacks. Originally popular in the 1980s, the Fish ‘n’ Chips brand was revived in early 2014 due to overwhelming trade and consumer demand. Costello continues: “The savoury snack sector is really on consumer trend at the moment, with Burton’s Fish ‘n’ Chips and Cathedral City Baked Bites meeting demand for products that consumers regard as both permissible and convenient. While sharing and single serve missions are stronger within convenience, multipacks account for over 10% of total Crisps & Snacks sales within the Impulse sector*2. 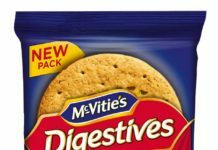 With research showing ‘Party/Sharing Snacks’ as a burgeoning sector, growing 9% YOY*5, Within the biscuit category sweet biscuits remain the most popular inhome snack and with the growing importance of food on the move, the need for the biscuit category to adapt to suit consumer needs is greater than ever before. “Despite the fact that consumers continue to enjoy sweet biscuits as an in-home snack, less than 5% of traditional sweet biscuits are available in a single serve out of home pack format*6,” says Costello. Burton’s single-serve packs include a 30g Maryland Gooeys twin snack pack and a 40g bag of bite-size Maryland Choc Chip Cookies, both available as 39p PMPs and plain packs (RRP 45p). 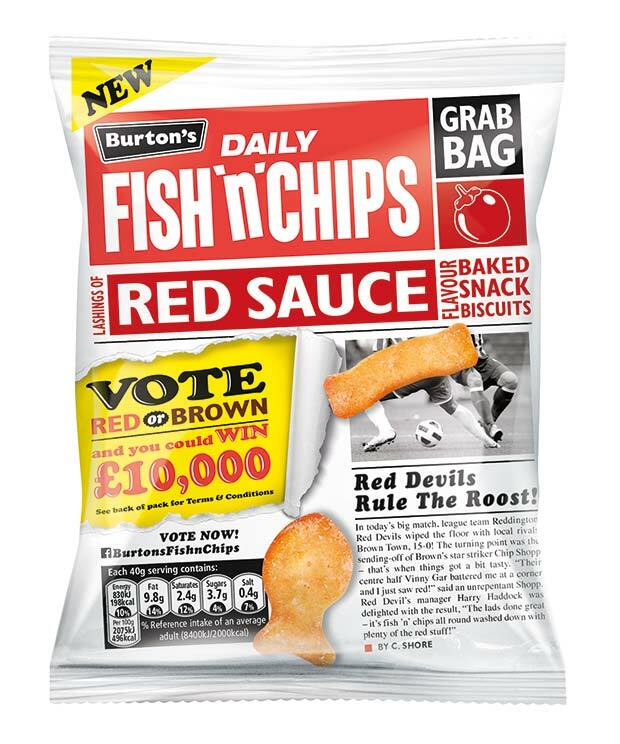 Burton’s announced in April that it was pitting Red Sauce against Brown Sauce in an epic ‘Battle of the Sauces’ under its £19.1m*7 Fish ‘n’ Chips brand. Both variants continued the brand tradition of classic flavours, with consumers being given 12 weeks to vote for their favourite flavour on Facebook, and the winner going on to become a permanent listing from July. 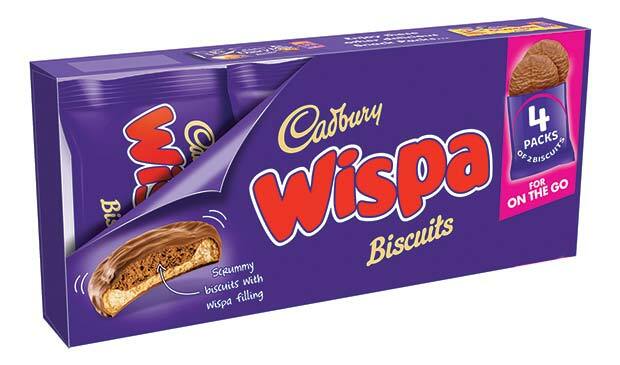 Launched in March, a new-look Cadbury Special Occasions range of Burton’s Cadbury Dairy Milk (110g), Cadbury Crunchie (130g), and Cadbury Wispa biscuits (124g) moved to 4 snack packs of 2 biscuits per portion (8 biscuits per carton, RRP £1.59). The company has invested in new technology to flow wrap and carton the new pack format for the £8.8m Cadbury Special Occasions range*8. The portion packs performed well in consumer research, with shoppers identifying the benefits of improved portion control and the opportunity to enjoy these household favourites when and where they choose*9. Customers shop by mission, so it is crucial that this is reflected in the way the range is merchandised, to drive sales and shopper footfall.